�Are you worried about paying higher taxes? If so, Dan Nigito�s book is indispensable reading. Are You an Accidental Philanthropist? According to financial expert Dan Nigito, our government is waging a �war on wealth,� that creates �accidental philanthropists� out of the most productive taxpayers. It is a system wherein Congress redistributes the taxes you pay without you having any say as to where the money goes. But there is a way in which you can fight back. 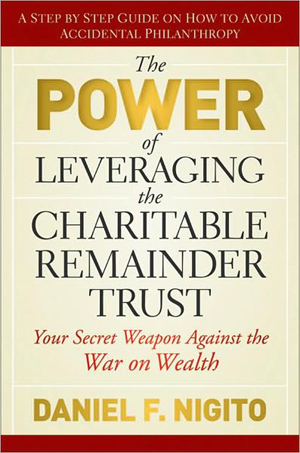 In THE POWER OF LEVERAGING THE CHARITABLE REMAINDER TRUST (Wiley; September 2009, $29.95; Hardcover) author Nigito�whose programs have saved families millions in tax dollars and created millions more for charities across the United States�will show you how. The simple, yet powerful strategy outlined here, known as charitable leverage, allows you to become a partner with charity while gaining control over your tax destiny and providing for you and your family. Nigito�s new type of wealth management reveals how combining a Charitable Remainder Trust (CRT) with Cash Value Life Insurance (CVLI) in a fresh new way can produce some amazing results for both individuals and charities. Daniel G. Nigito is the Chairman and CEO of Market Street Financial Advisors, LLC, and its subsidiary, Market Street Philanthropic Advisors, Inc. The combined mission of the two companies is to �provide wealth management for people who want to add meaning to their money.� The company specializes in using charitable remainder trusts and family foundations to provide strategies for wealth accumulation, preservation, and transfer for private clients and their families. He is the author of two previous books, Avoiding the Estate Tax Trap and Don�t Die Until You Read This!